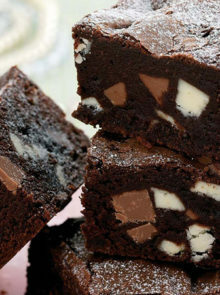 We’ve featured a number of showstopping puds over the years, but we all have our favourites. Check out this list of our most beautiful cake and dessert recipes – from luxurious tortes to exquisite bakes. It’s time to tuck in! 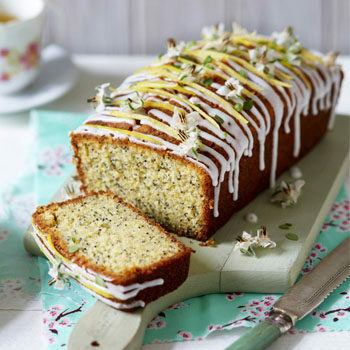 Lemon and poppy seeds are a classic baking combination, plus this loaf cake looks so elegant thanks to the addition of edible flowers, thyme and a drizzle of lemon glacé icing. 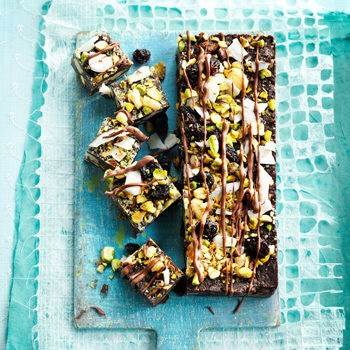 Fridge cakes are always an easy way to satisfy a sweet craving. They’re easy to bake and they’re usually quite rich, which means you only need a small piece to get your fix. However, this one is so good, you’ll be tempted to have more. 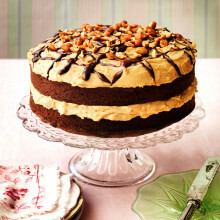 This has to be one of our favourite cake and dessert recipes ever! 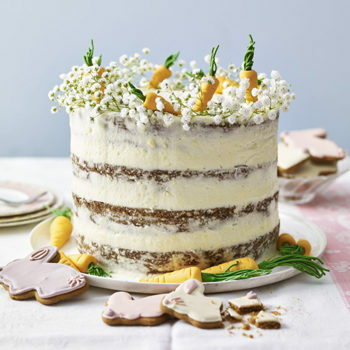 Perfect for an Easter Sunday get-together, but quite frankly, we think it deserves to be made all year round. 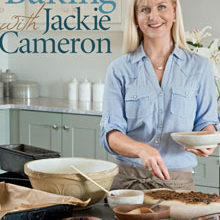 For something a little different, try this French custard flan. 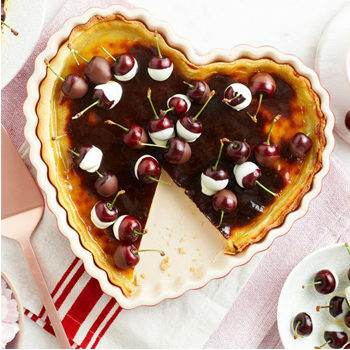 Its golden filling topped with chocolate-dipped cherries makes it worthy of a spot on our list of most beautiful dessert recipes. 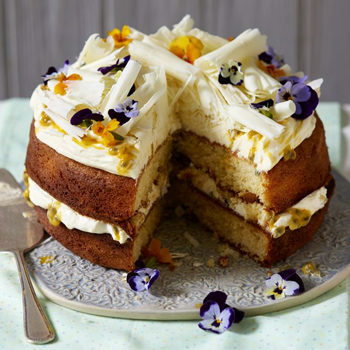 This moreish white chocolate cake uses sharp passion fruit for a tangy twist. Decorated with elegant chocolate curls and beautiful edible flowers (which makes it so eye-catching! 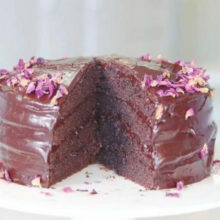 ), this dessert makes a nice change from the classic chocolate cake as it has a lighter feel, but is just as indulgent. A dessert recipe round-up wouldn’t be complete without a rich, luxurious chocolate torte. 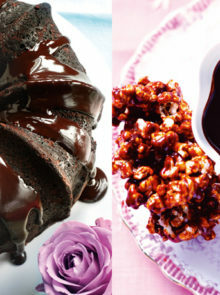 Not only does this one look spectacular, but it satisfies any chocolate craving you may have. 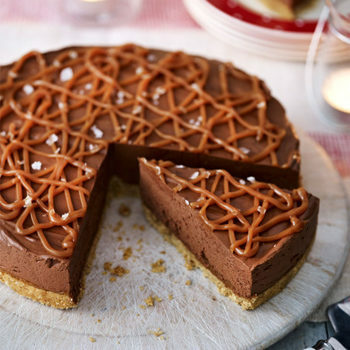 The salted caramel helps to cut through some of the richness, but a thin slice is really all you need. This is the ideal cake for a celebration. 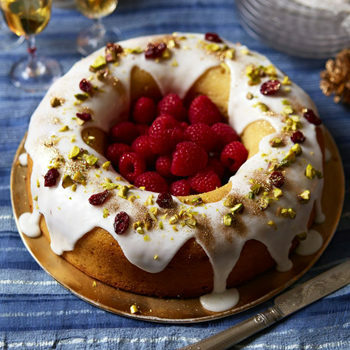 Decorated with fresh raspberries, gold dust and pistachios, it always makes an impression. Plus, it’s light and smacks of citrus, which is exactly what you need after a heavy meal. 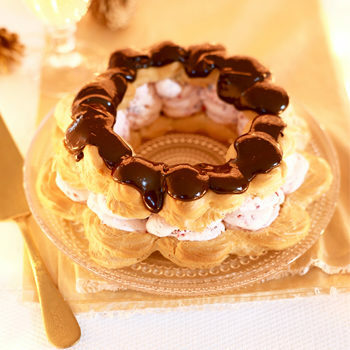 This choux wreath is a real wow-factor dessert that’s perfect for a dinner party. Eat it as soon as it’s constructed, though, to prevent the choux pastry from becoming soggy. Also, as the raspberry cream is light and fluffy, it can become runny if you leave it too long. 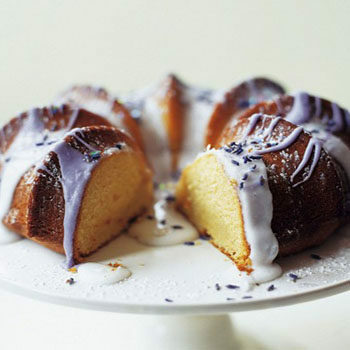 Drizzled with lavender icing and sprinkled with fresh lavender flowers, this beautiful cake tastes as good as it looks. It’s light, moist, and certain to give your taste buds a treat. Chocolate and hazelnut always work together beautifully. So when you decorate this delicious cake with fresh, seasonal fruit, you create a masterpiece. We topped ours with fresh berries, but you can use anything that’s in season. 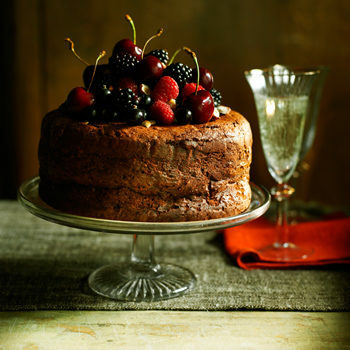 It looks so glamorous which is why it’s made our list of most beautiful cakes and bakes. 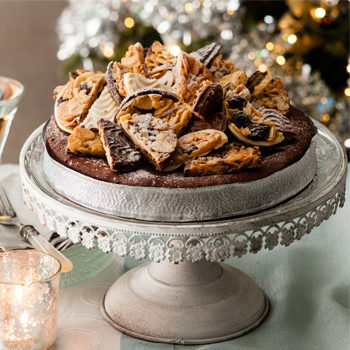 This impressive torte uses dark chocolate and chocolate Florentines to decorate, and it would look lovely as a centre piece for any gathering you have coming up. It makes enough for 10 people, so it’s perfect if you’ve got a crowd to feed.